Cliven Bundy Is a Free Man. His Cows Are Still a Nuisance. The Nevada rancher’s cattle are terrorizing people, threatening wildlife, and dying in the desert. Cliven Bundy is a free man. His cattle are still wreaking havoc across the Mojave Desert. Earlier this month, a federal judge dismissed all charges against Nevada rancher Cliven Bundy and two of his sons for allegedly organizing an armed standoff against the Bureau of Land Management in 2014. That’s when federal agents attempted to impound hundreds of Bundy’s cattle that had been illegally grazing on public lands for more than two decades. The government is still deciding whether to appeal the dismissal of the charges against Bundy, but regardless of the outcome of that case, the problem of Bundy’s cattle remains. For decades, his cattle have been terrorizing drivers, golfers, residents of the nearby town of Mesquite, and visitors to national and state parks as far as 60 miles from his ranch, while laying waste to endangered plants and threatening ancient archeological sites and petroglyphs. Rather than manage and control his cattle, [Bundy] lets them run wild on the public lands with little, if any, human interaction until such time when he traps them and hauls them off to be sold or slaughtered for his own consumption. He does not vaccinate or treat his cattle for disease; does not employ cowboys to control and herd them; does not manage or control breeding; has no knowledge of where all the cattle are located at any given time; rarely brands them before he captures them; and has to bait them into traps in order to gather them…Bereft of human interaction, his cattle that manage to survive are wild, mean and ornery. Bundy doesn’t round up his feral cattle and bring them into the barn during seasons when natural food supplies are scarce. Instead, they roam freely in search of food and water, and they have roamed far. Bundy’s original, federally approved grazing allotment covered 154,000 acres of public land. But his cattle, numbering anywhere between 500 and 1,000, have wandered over 500,000 acres of desert in search of food and water, an area that runs about 55 miles north to south—additional land for which he’s never had a valid grazing permit. It’s unclear how many Bundy cattle are still out in the desert since he was arrested in 2016. Bundy says the government has never been able to count them, but he estimates that he’s got about 500 head, a number he says suffered from the BLM’s attempt to round them up in 2014. According to E&E News, Bundy sold about 1,300 cows between 2011 and 2015 and at least another 400 during the nearly two years he was in jail. “They have paid some of the bills, so I’ve been blessed,” he told me in an interview. But the cattle are still breeding. In November, I visited nearby Gold Butte National Monument, which President Barack Obama created in December 2016 and which bumps right up against Bundy’s ranch. I saw a number of his ornery-looking cows alongside the road within the monument. Bundy’s refusal to rein in his cows is part of what sparked his war with the federal government. In 1993, officials decided to limit the number of his cattle allowed in various areas. They restricted grazing entirely during certain seasons to protect some of the native wildlife, in particular the endangered desert tortoise, which feeds on the same plants as the cows. The desert around Bundy’s ranch features scads of endangered plants, as well as fragile cryptobiotic soil crusts that can take hundreds of years to develop and are critical to holding the desert sand in place. The grazing restrictions would have required Bundy to run his business more conventionally—to round up his cattle in the winter and feed them at home. He refused to do this, and in 1993, he stopped paying the grazing fees for his designated allotment that, including fines, now top $1 million in arrears. He claimed that the federal government had no right to own land and thus had no jurisdiction over him. Bundy threatened to do “whatever it takes” to prevent the BLM from interfering with his cattle operation. 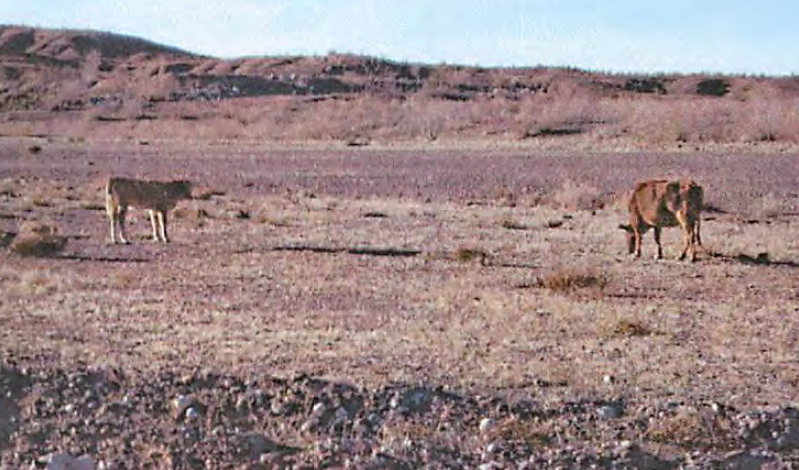 Bundy cattle near Lake Mead in 2012. The threat probably wasn’t necessary. The BLM, notoriously lax in enforcing grazing permits, turned a blind eye to Bundy’s trespassing cattle for years. But by 2001, the problem was getting difficult for the government to ignore. BLM and National Park Service employees have conducted several surveys, both from the air and the ground, and found that Bundy has at times had at least 900 cows grazing on public lands, many of them far outside Bundy’s designated grazing area. They’ve turned up in all sorts of places they shouldn’t be, generating a host of complaints from Mesquite residents and from Park Service and state wildlife officials who oversee recreational areas. Bundy cattle have long been a scourge at the state-owned Overton Wildlife Management Area, about 60 miles from Bundy’s ranch, where locals go to fish, and in the Lake Mead National Recreation Area. They have wandered near houseboats on the lake and threatened visitors and staff at the wildlife refuge. “We had to put down an aggressive bull,” says Doug Nielsen, who works in the Nevada Department of Wildlife’s Las Vegas office. Nielsen says the cattle come to Overton looking for water, shade, and food not available elsewhere in the desert. The feral cows have presented a particular threat to federal efforts to revive endangered native plant growth and habitat for endangered animals in Gold Butte and Lake Mead. In late 2012, the US Fish and Wildlife Service discovered that Bundy cattle had broken through a fence and were eating 400 seedlings that had been transplanted along the Virgin River to provide nesting habitat for an endangered bird, the southwestern willow flycatcher. These episodes are one reason Bundy’s cattle have cost taxpayers hundreds of thousands of dollars beyond his unpaid grazing fees. The BLM has attempted to put up fencing to protect delicate ecosystems and important archeological sites from the cows, sometimes without much success. In one 2012 episode, the cattle did $45,000 worth of damage to public land when they congregated around Lake Mead. Federal agencies spent more than $300,000 trying to inventory the cattle trespassing on public lands in the years leading up to the 2014 standoff. Meanwhile, Bundy’s laisse-faire grazing operation hasn’t worked out well for the cows. They regularly cross local highways and have been hit by cars. In 2011, a Lake Mead park ranger had to shoot a cow after a truck hit it on a scenic highway around the lake. The harsh landscape and predators take their toll as well. “This is some of the worst, least productive grazing land in the country,” says Kieran Suckling, executive director of the Center for Biological Diversity, an environmental group that has tangled with Bundy for 20 years. 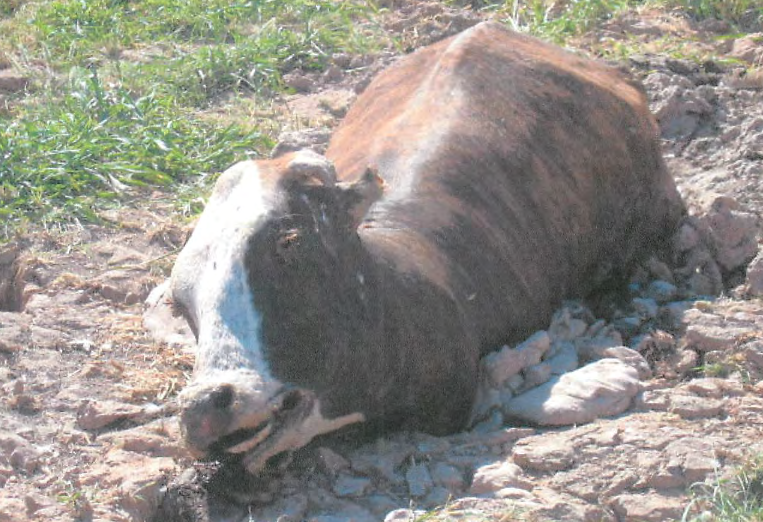 “His cows are starving.” Bundy cows have been found trapped in mud, and some have died that way. For years, Park Service employees have reported finding dead calves around Lake Mead. A dead Bundy cow near Lake Mead National Recreation Area. Bundy takes issue with the characterization by the government and environmentalists of his grazing operation. “My cattle are sort of special cattle that are developed to live in that desert climate,” he says. “I do have superior cattle to most cattle, and they’re very healthy.” He says very few of them die from natural causes, and they’re not starving. Bundy sees his operation as a benefit to the community. “I produce every day on that range, for human consumption,” he says. “I try to produce red meat, which is good to eat. What does the environmental community produce?” He says he’s not unconcerned about endangered species, including the desert tortoise. But he argues his cows are no threat to the tortoise, which he says get nourishment from cow manure. “As far as protection of endangered species, I don’t think anybody protects the endangered species as much as Cliven Bundy,” he says. “I welcome them on my ranch. That’s part of my culture.” He claims that his cows would never step on tortoises because doing so would hurt their feet. Environmentalists aren’t hopeful that the Trump BLM will take action to rein in the cows. “It would be my speculation that the Bundys could build the Aswan Dam out there and nothing would happen,” says Ruch.